I purchased this exclusively for cheese cutting. Brie and Cream Cheese mostly so it works great for this purpose. I have other knives I like better for vegetables. Feels great in the hand. I don't consider this a multi purpose knife though. I have wanted one a long time. It is light, sharp, easy to use, clean, store, etc. Great design. Because it is long and light, not best for super hard cheeses. Similar quality knife to my sister's Cutco knife. I like mine better. So great for cheese. No more strong arming that block of cheddar. I'm buying more for family members. It also arrived ahead of schedule. What a surprise! The Perfect Knife for any occasion! This is a knife that should be in every kitchen, ...no actually two in every kitchen would be perfect. 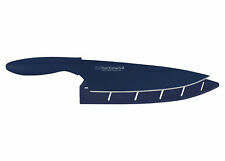 It serves more than just cheese, great for all manner of cutting, slips like a knife no pun intended. I was very impressed with this knife, Cuts veggies and meats very smoothly. Extremely sharp knife, and the tip is perfect for opening fruits and veggies. This is my "go to" knife. I highly recommend this one for anyone who loves to cook!! Japanese kitchen chef knife santoku japon japan couteau japonais 30cm 11,8"
Kitchen Knife Set Chef Knives - 8pc Gift Knive Sets - Stainless Steel Professi.. Premium Knife Set 12 Pieces Block Stainless Steel w/ Acrylic Stand Steak Knives.